I'm being careful what I wish for, alright! 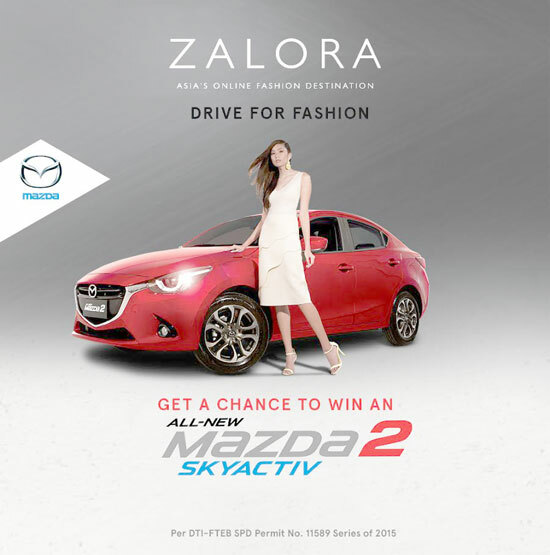 Because this September, Zalora is giving one lucky shopper a chance to win an ALL-NEW MAZDA 2 SKYACTIV! Yay! I want! ZALORA, Asia’s online fashion destination, and Japanese automotive brand Mazda have teamed up to bring in the “Mazda2 Drive for Fashion”. An exciting raffle game where participants are given a chance to go home aboard an all-new Mazda2 SKYACTIV R.
This online raffle runs from September 17 to November 30, 2015 and is open to all ZALORA customers. Upon completing the game and inputting his personal details (Name, Gender, E-mail address, Birthday, Contact No. Postal address), the customer shall receive an email with two promotion codes. The customer may use any or both of the two codes through shopping online at http://www.ZALORA.com.ph or through the ZALORA APP to earn additional raffle ticket- for the chance to win the MAZDA 2 SKYACTIV R.
Or purchase a minimum of P1500 on ZALORA which will earn the customer one (1) chance to win the grand prize Or purchase a minimum of P1000 on ZALORA with special promo code to be distributed in the October 2015 issue of Cosmopolitan and Preview magazines which will earn the customer one (1) chance to win the grand prize. By accepting the prize, the winner agrees to hold ZALORA free and harmless from any loss, injury, or damage caused by or arising from his/her participation in the program or caused by or arising from his/her acceptance and/or use of the prize. ZALORA reserves the right to verify the eligibility of the winning entry. The winner’s order (via the ZALORA website or ZALORA app using the codes stated in item 2 of the Promo Mechanics) should be a valid complete order, with no cancellations, returns and refunds. By participating in the raffle, the winner agrees to cooperate with and participate in any advertising or publicity activities of ZALORA relating to the draw. The winner agrees that ZALORA may publicize the name and photograph of the winner in such mode and manner as ZALORA considers fit. The links provided are not exhaustive and there may be other publicity channels.